Most senior play mostly for fun and to socialize with their friends. As a matter of fact most rounds of golf played in the country are played by senior golfers, more than any other age group combined. Actually all around the country golf courses consider the senior golfer their bread and butter as far as revenue. Many golf courses are also making their courses more and more senior friendly to compete for their business, some are even offering free senior golf tips if they so wish. A lot of senior women are also getting into playing golf to play golf with their partner and another couple and make a social event out of the day. The senior golfer may not be able to hit the ball as far as they once did but all golf courses now have installed senior tees which are closer and makes the game just as competitive for them as it is for their younger counterparts. They also combine their vast knowledge and experience to play a much smarter game and therefore score quite well. No matter if you are a senior golfer or a younger golfer you should also be aware of the fact that their is always the possibility of injury. The golf swing is a very unnatural movement which can put a lot of stress on many parts of your body, including your hips,shoulders, torso and your back. Playing golf can provide you with a lot of health benefits. You can really increase your physical ability playing golf buy not always driving around the golf course in a golf cart.If,you do use a cart drive past your ball and then walk back to it with the club you will need to hit you next shot. If,you do this on even only nine of the eighteen holes it will increase your health tremendously. Also their are small nine hole courses that you can rent a pull cart and play your round that way, very beneficial. The one thing i recommend not doing is carrying your golf clubs. As we all get older and are suddenly are considered senior golfers one would automatically think that our golf skill and intensity would decline but that does not have to be the case. Of course as we get older it’s only natural that we will not maintain the same level of play that we had in our younger years but it is still possible.If,you are a senior golfer just please don’t give up. The main thing we need to focus on here is our bodies. Have during your last few rounds of golf you felt that your back swing does not go back as far as it used to, or your swing speed does not seem as fast or maybe your drives are not going has far as they used to, if so they it’s probably time to work on your body. A lot of senior golfers first feel that they first have lost a lot of flexibility but they never consider that they have lost strength along with the flexibility. As a senior golfer the first things you will need to get started is by improving flexibility, strength, endurance and nutrition. These are most important in a good golf fitness program. The best golf tip for seniors here is to not start out to fast, you must start slow so for one you don’t get hurt and two you don’t lose interest before you get started. You first need to know your limitations and limit your golf program within those limitations. In this day and age you should have now problem finding e-books or videos that will fit the criteria of your current shape. I suggest not taking any golf lessons before you get your fitness program where you want then by all means take a lesson or two and go enjoy your new golf game. Whether you are playing football, baseball,basketball or any sport for that mater golf is no different then any of them, you need to warm up. I see so many golfers pull up in their cars throw their shows on grab their clubs go in the clubhouse, take a couple swings and head to the first tee. By doing these chances are the first five or six shots are going to go who knows where, thus setting yourself up for a start you may never recover from and therefor ruining your round of golf before it even gets started. My first tip here is to try to get to the golf course at least an hour before you are scheduled to tee off, get your shoes on, take care of business in the clubhouse. All in a relaxing manner. Now grab your putter and head to the putting green, practice some put from around twenty feet,then some from thirty feet, then ten feet, then short putts. This will give you a good idea of the speed of the greens. Now grab a couple wedges and practice some chips around the green to get the feel of the rough around the green. Next you will want to head off to the range where you want to spend about ten minutes doing some stretching and limbering up exercises before you start taking some full swings. Start out on the practice tee hitting some easy wedges then slowly go through your bag hitting all your clubs until finally get to your driver. 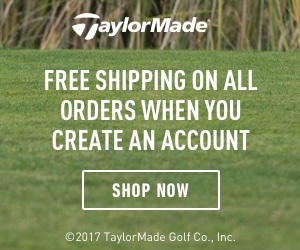 Hit about half a dozen balls with your driver until you feel comfortable with it. You can now head to the first tee. Do a little more stretching. Right before you tee off. Then hit your drive right down the middle. I hope the information and tips on this page and benefit you in your quest for making golf much more enjoyable in your senior years, I will do another post late delving into all the different golf clubs and other equipment you must have in your golf bag. Please leave a comment below if this has been any help to you, or if you have any questions i would be more than happy to answer them. You’ve provides great tips here. Thank you. 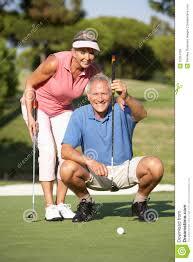 I notice there senior are more and more playing golf in my area. Recently, I’ve been having shoulder issues and haven’t got to the golf course for about a month now. Definitely, try some tips in this post. Thank you, Robert, for an excellent article and tips. As we get older mentally we still think we are young but we forget the body has aged, so as you quite rightly say it is very important to do warm-up exercises before you tee off. As a senior golf player, I too would recommend not carrying your golf clubs as there is a very good risk of injury. One of my friends hurt his back carrying his golf clubs. You have a great site with very interesting articles and I am sure I will back again to check out some more articles… keep up the good work! Hi Robert, that is some good information that you have there in your post. I can see where it would help people. I loved the bit where you advised against carrying your own golf clubs. I assume that this is to prevent potential health related concerns. I would assume that some training by a professional golfer would be required in order to start golfing so that the correct and proper way to golf are learned and practiced, so that any potential health related concerns are addressed before they become concerns. To many that play, golf is such a passionate sport, and I know from my families involvement they hope to play well into their senior years. Many of the players in our area are aging and I see them struggling quite a bit as they traverse the course, too many of them carrying their golf clubs as ours is a little agricultural to say the least. Great tips for everyone I feel but I’ll be sure to encourage my older family members to stretch and put in that bit of extra effort before teeing off next time they play. Great article and great suggestions. I am not yet at the point of senior golf (I hope), but there are many recommendations here for any age. All of us should warm up and stretch out before starting out. 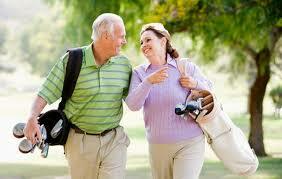 I also never thought of the social aspect for seniors and golf. I can see that being very beneficial for them. Lots of great ideas here. Thanks so much for sharing. Thanks, Robert, for this great post. A lot of great tips here. My husband and I are seniors, so this is very applicable. He’s the golfer though. And loves it. Me, I’d rather drive the cart, lol. He’s always been good at stretching beforehand, and can still hit that ball pretty far. But yes, things do slow down a little as we get older. Personally, I need to invent a club that doesn’t miss, haha.